Got the new TS MPPT 60 installed over the weekend. It went quite well, I struggled a bit to get the ethernet part of it working on an old vista laptop, but it is working and got the custom settings part mastered , (the struggle would be on my part because I'm not great with that stuff, ip addresses and such) and live view is working on an old router if I want it. I think I like this unit, it seems very well built, it was decent to work on, the connection box roomy is enough. Also 2 messages to Morningstar tech support were replied to in a very timely fashion. I also got the remote display for it and put ends on an existing CAT5 cable that was already in place to run it. This display seems to have a lot of information available in it, I first was not going to get it, but am glad that I did. 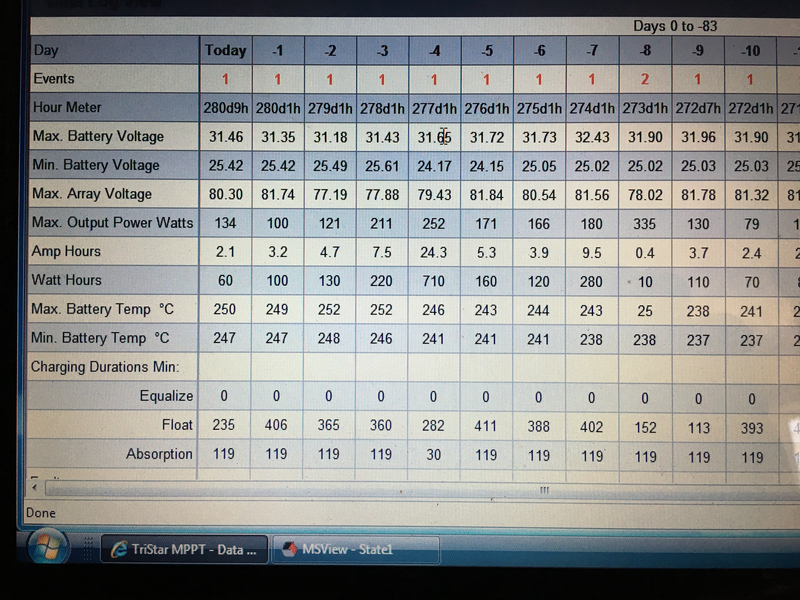 As mentioned in this discussion, http://forum.solar-electric.com/discussion/351944/charge-controller-done#latest I think my batteries are going to be in absorb a lot more than they used to be, as it charges a bit differently than my last CC, the logs would already indicate this to be true. So I will need to watch water levels a bit closer for sure. So far so good, special thanks to a fella that goes by "Commsprepper" on youtube, he has several videos that show how to set these up that were very helpful!! 510 watt pv, TS-MPPT 60, Exeltech XP1100, XP600 & XP250 @ 24V, 4x Trojan 105RE, Trimetric 2030, Yamaha EF2400i gen.
Good to hear feedback, keep the updates rolling in, others may benifit from your experience. My TS MPPT 60 150 V has been live now for a year and hasn't missed a beat. I started with new Trojan T105 batteries and the specific gravity of them has actually improved over the last 6 months, so what ever it is doing, it's doing it well. My bank doesn't drop below 80 % of full charge and the unit auto equalizes every month on the FLA's battery program included in the Morningstar set up. Good luck with yours! Well my new TS MPPT 60 has been up and running for 38 days now, I really like this charge controller. As I mentioned earlier my batteries are spending waaaay more time in absorption as this unit goes by time, I have it set at 150 min. My old CC went by end amps first, and time if loads kept end amps from going low enough to transition to float. As I expected, my water consumption appears to be increasing. I got the remote display for it and am glad I did as there is lots of info available. The display is only 2 lines however which means you have to navigate around a bit to find what you want, but it's good. I would say if you were thinking of getting the display that mounts on the unit, consider getting the remote one as you could mount it right beside the CC, provided you have the space. I used a grey plastic 2 gang box, then if you need to get inside the CC you don't have to remove the display, or you could move it in the future if you decide to. MSView seems to be pretty decent, I really like the data log on the live view, you can see very easily what has been going on and spot trends in your different readings. For whatever reason I could only access the CC using the ip address, but once I figured that out it's been fine, I have an old windows vista laptop that I use to set it up, that was a bit of a struggle, but it worked. Remote monitoring is not something I am planning on doing. As far as the led lights to indicate state of charge, it seems a little gimmicky to me, unless the batteries are at rest, as loads on the batteries will change the light colours. FWIW, I'm giving the TS MPPT 60 a big 2 thumbs up!! I'm thinking of shortening my absorb time to maybe 120min? My system is lightly used and I usually only put 1 or 2 real cycles (down to maybe 80% from full) on the batteries a month, so I was wondering if 150min per day was a little excessive ?? I have absorption at 29.6 volts. If I think of anything else I'll put it on here. I hardly use the front panel, and rely heavily on the web server to get charging and battery info. TS-MPPT 60 been up and running couple months now, working flawlessly. Water consumption is up as expected, been adding a bit about once a month, that is a lot more than previously. The TS-RM2 remote meter however has been giving me grief, Morningstar is sending a new one out to me. I have to say Morningstar has been excellent in terms of customer service and I would not hesitate to recommend. Can you elaborate on the problems with the TS-RM 2, just curious as to what problems you had. Every time the left hand arrow (or back button) is pushed, the display goes out and reboots. Morningstar sent out a new TS-RM-2 display and I installed it today, Thank you very much!! One reading that I think I miss on the TS-RM 2 is the solar panel volts and amps going to CC (my old CC had this). Solar volts is in there but you have to dig a bit for it. (In diagnostics I think) But no big deal, there is lots of info in the display, you just need to roam around a bit to get it. As with anything, with time you become more fluent, navigation becomes second nature, good to hear you got support and everything's working. MS is the best when it comes to initial quality and also service and support after the sale. I have had my TS-MPPT-60 running for four years now and I love it! The only issue I have had is that it resets/reboots itself from time to time. I reported this to Morningstar two years ago and they did not confirm the problem until early this year when (probably) other people started reporting the same problem (see other discussion on this forum). After that they sent me a beta-relsease (v1.27) of the firmware which I have used for three months now without any issues so I guess it will be released to the public soon. The TS-MPPT 60 has been running just fine since last may now, no real problems at all. The only thing I can mention is I looked on live view just recently (first time in months) and in the data log the battery temps are completely out to lunch. It has logged min/max battery temps in the 230-250 degree celsius range every day, except on a day that I reset the controller, when it registered the traditional 25 degrees C.
The remote display is showing the correct temps, so I suppose it is just a software glitch. I will probably just live with it as the chances are high that I would brick the CC if I attempted to update the software, haha, funny but true. Anyone else seeing this issue? I am running SW v26. Could there be a decimal point missing? 23.0. 23.4 etc. No, these temps are over the winter and its been cold, my batteries have spent much of the winter at -20C something. A few months ago the temps recorded were correct, not sure what happened, will send that info to Morningstar sometime. A pic of odd battery temps, note the 25C temp on day 8, the controller was reset, which then records 25 degrees C, another little glitch. Hello Mryimmers, I have been using the TS-MPPT 60 for about 8 years now without any issues. I have a few questions on this unit, and I hoping on this thread you may be able to advise or direct me to where I could obtain some answers and direction. My question in in reference to your statement " MSView seems to be pretty decent, I really like the data log on the live view, you can see very easily what has been going on and spot trends in your different readings. For whatever reason I could only access the CC using the ip address, but once I figured that out it's been fine, I have an old windows vista laptop that I use to set it up, that was a bit of a struggle, but it worked" I would like to update the CC so that I can view the data log on my PC, currently I am using windows10 on a Dell i5 PC. I have all the owner's manuals and documents for the TS-MPPT 60 as well, however I was wondering if you are able to give me some direction on this set up to view from the PC or direct me to where I can obtain this information. Thank you for your time. Hi Ski66, In all honesty you should post your questions in a new thread, there are many knowledgable people on here that know a lot more than I do. I'm not sure if your 8 year old TS-MPPT 60 would be the same as the new ones, as the new ones have a built in "web server", I think they call it. You can simply connect with an ethernet cable and using software downloaded from morningstar, you can access your charge controller, and read stored information and program the unit. I struggle with this computer stuff and I know there are others on this site that will be more helpful, haha. On mine I have a 100' ethernet cable running from shed where CC is, to the cabin, I had it plugged in to a router, but I could only get Live View to work a couple times (over wifi). I've kind of given up that, now I just have the ethernet cable plugged directly into the old laptop, open internet explorer, type in the CC ip address and I'm on Live View, or just open MS View and connect to CC. There is no internet out there, other than on my phone. I wanted to use the old router so that I could just check it on my phone, but for some reason I can't make that work. Ski66 , do you have an Ethernet port on your CC? How about the meter that is available for that charge controller? A lot of information is available with that meter too. Anyway, since this category is reviews and opinions I still give the TS-MPPT 60 a big 2 thumbs up, an excellent piece of gear, although there seems to be some minor software quirks. I don't have the meter hub, just an ethernet cable from CC to laptop (windows Vista). That NETBIOS name (tsmpptXXXXXXXX) (Xs being the unit's serial ##) did not work for me, but I was on a youtube video were a guy used the ip address, so I tried that and it worked. I don't remember off hand where I got the ip address from, was it on a sticker on side of the CC? Not sure. Search for a guy on youtube that goes by the name "Commsprepper", he had some very good videos on programming his TS- MPPT 60 that I found really helpful. Mine is not connected to the internet as I don't have internet at that location. Hope that helps good luck!! So When I connect up to the unit, will it have an automatic default IP address for windows ? Thank you! All the information is there that I needed per the youtube video under Commsprepper. The TS- MPPT 60 has a lot of great features that are still up to date with todays technology, Imo. Great unit. Not sure this is allowed here. But I have a gently used TSMPPT 60 for sale. It's out of warranty, but it's built like a tank, no issues whatsoever. It looks like new and there is only one small opening punched out where my cables were going in, on the side. I can send pictures on demand, no problem. I'm asking $500 for it. 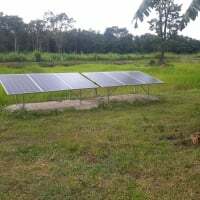 No problem with members selling personal solar power equipment on the forum (not as a business). Thank you, then I might make a new post, for better exposure, this is a review channel after all.